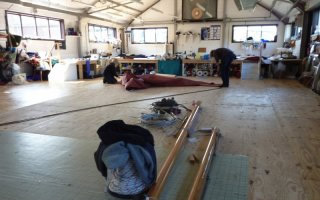 Wilkinson Sails are a small Kent sailmakers, established in 1975. Our motto of quality cruising sails has seen us make many blue water sails, lasting the test of time and miles. We have set out to make a better value, british designed and superior constructed cruising sail. This means that our sails last far longer,made out of the best materials available on the market. In making a superb quality product, offering a personal service on board and long guarantees. We aim to give our customers many more miles for their pound. Originally founded in the village of Conyer around 1975, we were working from the local boatyards before moving to larger premises at the top of the creek in Faversham during 2010. We have a loyal client base who return for annual valeting and repairs,during the winter months. During the season we try and carry out most emergency repairs with an overnight turn round. More than just a Sailmaker! We also offer custom made and designed sprayhood, covers, canopies, sail stak packs, shade sails, dodgers, tents bags, right up to fully fitted winter covers. Our service also includes a full rigging shop,supplying masts,booms, furling gears, spinny poles and Gennaker Bowsprits. We can visit your boat and rectify problems with furling systems. We also carry out all types of wire splicing,roll swaging and talurite splices made to measure and rig packages supplied. We carry out on board rigging surveys,and halyard checks advising on replacement strategy to upgrade and improve your sailing. We can also make up and supply new halyards, sheets and other cordage.New blocks, clutches and winches can be fitted for you. If you are considering any rig change please feel free to contact us for advice. We are always pleased to help.